Несмотря на то, что понятия возможных миров и субстанций являются очень важными в современной метафизике, существует сравнительно мало попыток объединить их. В статье рассматривается метафизическая модель возникновения и эволюции возможных миров в результате взаимодействия между субстанциями. 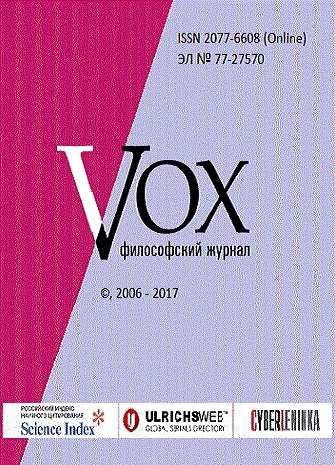 Модель опирается на учение Лейбница о возможностях, согласно которой каждая сущность или возможность обладает тенденцией к существованию. Предполагается, что активность субстанций может быть непрерывно направлена ​​на использование указанной тенденции всеми возможными способами. В результате согласованные и устойчивые взаимодействия между субстанциями способны порождать устойчивые объекты в одном из множества миров. Таким образом, именно активность субстанций может порождать переход от возможного к актуальному бытию в форме существования многих миров. Adams, R.M. (1974). Theories of Actuality. Noûs, Vol. 8, No. 3, 211–231. Armstrong, D. M. (1997). A World of States of Affairs. New York: Cambridge University Press. Armstrong, D. M. (2004), Truth and Truthmakers, Cambridge University Press. Bird, A, (2006). Potency and Modality. Synthese. 149, 491–508. Bird, A. (2007). Nature's metaphysics: Laws and properties. Clarendon Press. Blackburn, S. (1993). Essays in Quasi-Realism. Oxford: Oxford University Press. Blumenfeld, D. (1973). Leibniz's theory of the striving possibles. Studia Leibnitiana, 163-177. Cao, T. Y. (2003). Structural realism and the interpretation of quantum field theory. Synthese, 136(1), 3-24. Chalmers, D. J. (2002). The components of content. Philosophy of Mind: Classical and Contemporary Readings. Oxford University Press. Chihara, C. (1998). The Worlds of Possibility, Oxford University Press. Della Rocca M. (2002). Essentialism vs. essentialism. In Tamar Gendler & John Hawthorne (eds. ), Conceivability and Possibility. Oxford University Press. 223—252. Divers, J. (2002). Possible Worlds. London: Routledge. Ellis, B. (2001). Scientific Essentialism. Cambridge: Cambridge University Press. Ellis, B. (2002). The Philosophy of Nature: A Guide to the New Essentialism, Montreal: McGill-Queen's University Press. Epperson, M. (2004). Quantum Physics and the Philosophy of Alfred N. Whitehead. Fordham University Press. Fine, K. (1994). Essence and Modality. In Philosophical Perspectives 8, ed. J. Tomberlin, 1-16. Forbes, G. (1985). The Metaphysics of Modality. Oxford: Clarendon Press. Herrick, P. (1999). The Many Worlds of Logic. Oxford: Oxford University Press. Hintikka, J. (1970). The Semantics of Modal Notions and the Indeterminacy of Ontology. Synthese, 21, 408-424. Hintikka, J. (1983). Situation. Possible worlds, and Attitudes. Synthese, 54 (1), 153-162. Hoffman, J. & Rosenkranz, G. S. (1997). Substance: Its Nature and Existence. London: Routledge. Kauffman, S. (2002). Investigations. Oxford University Press. Koslicki, K. (2008). The Structure of Objects. Oxford: Oxford University Press. Kripke, S. (1980). Naming and Necessity. Cambridge: Harvard University Press. Ladyman, J., Ross, D., Spurrett, D., & Collier, J. G. (2007). Every thing must go: Metaphysics naturalized (Vol. 61). Oxford: Oxford University Press. Leibniz, G. W. (1951). Leibniz: Selections, ed. Philip P. Wiener. New York: Scribner's. Leibniz G. W. (1989). Philosophical Essays. Ed. by R. Ariew and D. Garber. Indianapolis: Hackett. Loux, M. J. (1978). Substance and attribute: a study in ontology (Vol. 8). Springer. Loux, M. J. (Ed.) (1979). The Possible and the Actual: Readings in the Metaphysics of Modality. Cornell University Press. Loux, M. J. (2002). Metaphysics: A Contemporary Introduction. Routledge Contemporary. Introductions to Philosophy Series (pp. 106-107, 110). Taylor & Francis. Lowe, J. (1998). The Possibility of Metaphysics: substance, identity and time. Oxford: Clarendon Press. Lowe, J. (2006). The Four-Category Ontology: a metaphysical foundation for natural science. Oxford: Clarendon Press. Mulhall, S. (1996). Heidegger and Being and Time. Routledge. Plantinga, A. (1974). The Nature of Necessity. Oxford: Clarendon Press. Rescher, N. A. (1975). Theory of Possibility: A Constructivistic and Conceptualistic Account of Possible Individuals and Possible Worlds. University of Pittsburgh Press. Rescher, N. (2006). Process Philosophical Deliberations. Frankfurt: Ontos Verlag. Romer, H. (2006). Complementarity of process and substance. Mind and Matter, 4(1), 69-89. Shields, C. J. (1986). Leibniz's Doctrine of the Striving Possibles. Journal of the History of Philosophy. 24(3), 343-357. Shoemaker, S. (1984). Identity, Cause, and Mind. Oxford: Oxford University Press. Stapp, H. (2007). Mindful Universe: Quantum Mechanics and the Participating Observer. Berlin: Springer Verlag. Whitehead, A. N. (1969). Process and Reality. New York. Yablo S. (1993). Is conceivability a guide to possibility? Philosophy and Phenomenological Research, 53 (1), 1-42. Zalta, E. N. (2006). Essence and modality. Mind. 115 (459), 659-693. Zimmermann, R. E. (2000). Loops and Knots as Topoi of Substance Spinoza Revisited. arXiv preprint arXiv: gr-qc/0004077v2.